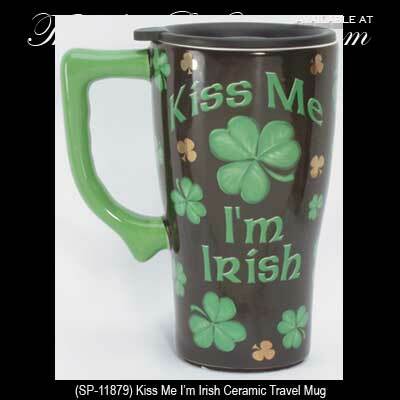 This ceramic Irish travel mug features a design that includes shamrocks and the words, Kiss Me I'm Irish. The shamrock travel mug includes a lid that with a quarter turn opens the sipping hole and vent. The 6 1/2" tall travel cup holds 14 ounces of coffee and it is gift boxed with a shamrock history card that is complements of The Irish Gift House.